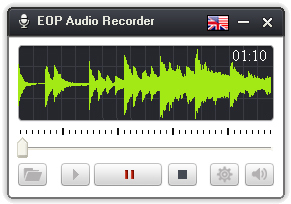 · Release EOP Audio Recorder V1.0.8.8. I can not install on my computer, the message that appears is: "not find out stereo equipment, ready to record failed!" My stereo mixing is turned on and still does not work. This just in the audio recording of the computer when I record my microphone works. What is the system of your computer? Windows10, how can i fix it? I am sorry，EOP Audio Records cannot work well on some WIn10 system. You can try other recorder tools. I am sorry for that, I think maybe EOP Video Recorder can not work well in your pc system. 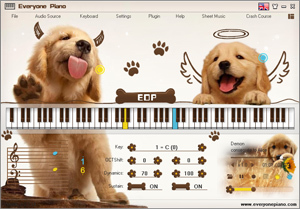 Why my everypiano, every time that i record a melody, the sound is not comes out ? You need first make use the stereo equipmet is on work, you can follow the above steps to find the stereo equipmet and enable and set it as default device. Standart Realtek program "record sound" work, yours not. Why? I can't record my songs with .mp3. It says that i have problems with my stereo equipment. And i have tried your solution up there but the horn icon didn't open anything else further than the volume. What's wrong? Click the horn icon with your right mouse button not the left one. And if you mean there do not have any other disabled devices available. It means your pc do not have any stereo equipment. Same problem. Install latest Realtek Drivers, click on "horn" icon, pressed on "Recording Devices", press on stereo mixer, well I did everything from "solution". Still not work. Any idea why? You want to convert a EOP file to Mp3? It can not convert directly, you can use EOP Audio Record to record the song when plays the eop file with EOP program, then you can get a mp3 file. why i can't convert to mp3? i can't find horn icon. It can not convert directly, you can use the plugin of EOP,EOP Audio Record to record the song when it plays with EOP, then you can get a mp3 file. How find "loudhailer" on windows 8.1, because i cant find it at the down right of the screen.. I'm sorry for that, since we do not have win8.1 system, you can search it on google to find the loudhailer. why so low noise recorded sound ??? Do you mean when playing the recording, some noise in it? you can turn off currently useless programs when recording,since more programs running at the same time, more CPU will be used. Please how can i convert to mp3 files? Please find the "settings" button and click "Output" to find the File Name, then choose the MP3. How can i convert to mp3? 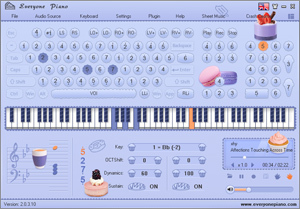 I love Everyone Piano, I love all of your software, and I love the developer too !!! Thank you. Wish you love our software.